Great news for the campaign for driver’s licenses for all in Pennsylvania! Winning support from religious denominations like the United Methodist Church is a critical piece of our strategy to pass PA House Bill 1450, driver’s licenses for all. In a time of heightened anti-immigrant sentiment, we are building with allies across Pennsylvania including diverse religious denominations. Click here to learn more about the 40+ endorsing organizations and the other religious denominations working to endorse the campaign. The resolution was formally presented by NSM member congregations Arch St UMC and Calvary UMC, as well as the Eastern PA Conference Immigration Rapid Response Team. We thank our United Methodist members for their tireless and successful organizing efforts over the past months, and especially thank leader from Calvary UMC Lauren Ballester for presenting the resolution in front of 1,000 voting delegates! Presented by Calvary United Methodist Church, Arch St United Methodist Church and the Eastern PA Conference Immigration Rapid Response TeamWHEREAS, The United Methodist Church believes that all persons are equally valuable in the sight of God and that it is the responsibility of the church to demonstrate that belief. WHEREAS, the estimated 200,000 undocumented immigrants in Pennsylvania are denied access to driver’s licenses preventing them from driving to work, school, healthcare appointments and stores and shops of all kinds, thus impeding them from caring for their own families and neighbors as well as making a significant contribution to the local economy. WHEREAS, the opportunity for undocumented immigrants to drive legally includes passing a driver’s test and obtaining automobile insurance thus making roads safer for all. 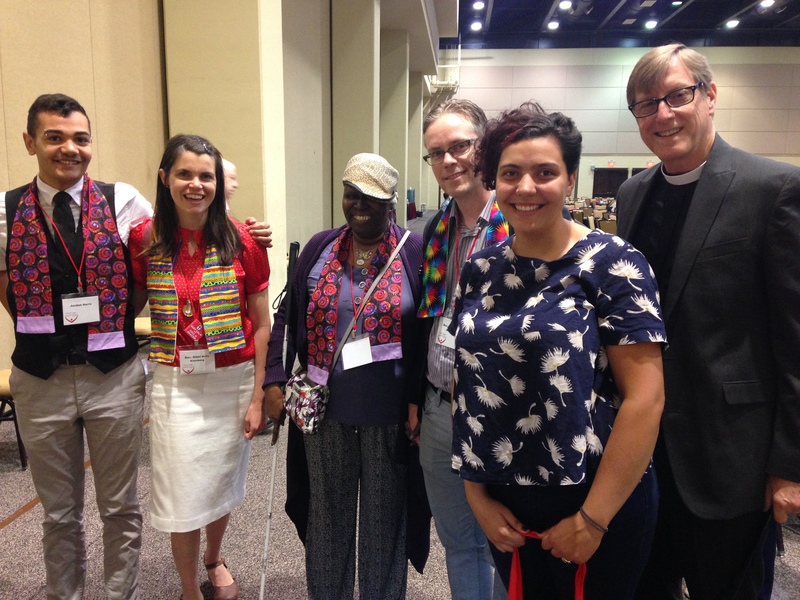 WHEREAS, The United Methodist Church has adopted resolutions and supported legislation that offer God’s love and grace to welcome immigrants, oppose policies that threaten family unity and promote comprehensive immigration reform. WHEREAS, common-sense legislation has been put forth in the Pennsylvania House of Representatives in the form of HB 1450 to provide access to driver’s licenses for Pennsylvania residents regardless of immigration status in order to improve the Commonwealth’s economy, public safety, and the lives of immigrants. THEREFORE, BE IT RESOLVED, that The United Methodist Church of Eastern Pennsylvania demonstrate support for HB 1450 which allows access to driver’s licenses for undocumented Pennsylvanians by authorizing the presenters of this resolution to send a copy of the resolution to the appropriate set of elected officials and recommends that United Methodist agencies, congregations and individuals endorse this legislation as it is introduced and communicate that endorsement to the appropriate elected officials. Person Responsible for Presenting Resolution: Lauren Ballester, Calvary United Methodist Church, Judy Claude, Arch Street United Methodist, Ruth Daugherty and Rev. Lilian L. Cotto, Co-chairs of the Immigration Rapid Response Team of the Eastern Pennsylvania Conference. I move for the adoption of resolution 2016-07. In our prayer of repentance yesterday, we asked God, ‘for eyes to see the pain of others, and open hearts to love one another,’ so as you consider saying yes to this resolution, open your eyes to the pain of our undocumented neighbors and remember The Seneca greeting that echoed in this room yesterday, matakweeasay, we are all relatives. This resolution supports extending God’s love and grace to all members of God’s kingdom by joining over 40 organizations across the state in endorsing House Bill 1450 in the Pennsylvania House of Representatives which would allow undocumented immigrants to apply for driver’s licenses. This is already the law in 13 states. With this law, undocumented drivers would need to fulfill the same requirements as all other drivers such as passing written and road tests. Giving undocumented drivers the opportunity to obtain driver’s licenses makes the roads safer for all of us, as more drivers would have passed driver’s tests and have insurance. It would not allow undocumented immigrants to obtain welfare benefits or travel outside the country. Presently in Pennsylvania undocumented immigrants cannot obtain driver’s licenses. This makes Pennsylvania roads less safe and hurts our economy. Workers who need to drive to get to their work are either driving without licenses or insurance, or they are not working.. Some 200,000 undocumented people in Pennsylvania cannot legally drive to their places of worship, work, school, or hospitals.. If they do drive without a license, they are at risk of being deported for driving without a license. Families are torn asunder. Here’s an example. David lived with his family in Chambersburg, PA and worked on a family dairy farm. He awoke at 3am each day to drive to work to support his family. When his car broke down on his way to work, a police officer offered assistance. However, when the officer realized David was driving without a license and undocumented, Immigration (ICE) was notified and David was immediately deported to Guatemala. His children lost their father; his wife lost her husband; the family farm lost a worker. People like David are in our churches and in our communities. They are our neighbors and fellow children of God. We need to support them. Jesus said, “I was hungry and you gave me food, thirsty and you gave me drink, a stranger and you welcomed me.” As Christians, we are called to welcome the “strangers” among us. Welcoming the stranger helps all of us, undocumented and citizens. I move for its adoption. Supreme Court blocks DAPA: Immigrant leaders respond“Sanctuary in the Streets” Raid Response!